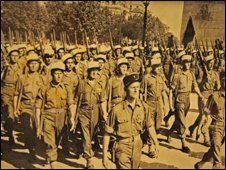 Papers unearthed by the BBC reveal that British and American commanders ensured that the liberation of Paris on 25 August 1944 was seen as a "whites only" victory. Many who fought Nazi Germany during World War II did so to defeat the vicious racism that left millions of Jews dead. Yet the BBC's Document programme has seen evidence that black colonial soldiers - who made up around two-thirds of Free French forces - were deliberately removed from the unit that led the Allied advance into the French capital. By the time France fell in June 1940, 17,000 of its black, mainly West African colonial troops, known as the Tirailleurs Senegalais, lay dead. Many of them were simply shot where they stood soon after surrendering to German troops who often regarded them as sub-human savages. Their chance for revenge came in August 1944 as Allied troops prepared to retake Paris. But despite their overwhelming numbers, they were not to get it. 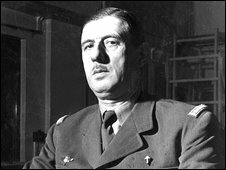 The leader of the Free French forces, Charles de Gaulle, made it clear that he wanted his Frenchmen to lead the liberation of Paris. Allied High Command agreed, but only on one condition: De Gaulle's division must not contain any black soldiers. In January 1944 Eisenhower's Chief of Staff, Major General Walter Bedell Smith, was to write in a memo stamped, "confidential": "It is more desirable that the division mentioned above consist of white personnel. "This would indicate the Second Armoured Division, which with only one fourth native personnel, is the only French division operationally available that could be made one hundred percent white." At the time America segregated its own troops along racial lines and did not allow black GIs to fight alongside their white comrades until the late stages of the war. Given the fact that Britain did not segregate its forces and had a large and valued Indian army, one might have expected London to object to such a racist policy. Yet this does not appear to have been the case. A document written by the British General, Frederick Morgan, to Allied Supreme Command stated: "It is unfortunate that the only French formation that is 100% white is an armoured division in Morocco. "Every other French division is only about 40% white. I have told Colonel de Chevene that his chances of getting what he wants will be vastly improved if he can produce a white infantry division." Finding an all-white division that was available proved to be impossible due to the enormous contribution made to the French Army by West African conscripts. So, Allied Command insisted that all black soldiers be taken out and replaced by white ones from other units. In the end, nearly everyone was happy. De Gaulle got his wish to have a French division lead the liberation of Paris, even though the shortage of white troops meant that many of his men were actually Spanish. We were colonised by the French. We were forced to go to war... France has not been grateful. Not at all. The British and Americans got their "Whites Only" Liberation even though many of the troops involved were North African or Syrian. For France's West African Tirailleurs Senegalais, however, there was little to celebrate. Despite forming 65% of Free French Forces and dying in large numbers for France, they were to have no heroes' welcome in Paris. After the liberation of the French capital many were simply stripped of their uniforms and sent home. To make matters even worse, in 1959 their pensions were frozen. Former French colonial soldier, Issa Cisse from Senegal, who is now 87 years-old, looks back on it all with sadness and evident resentment. "We, the Senegalese, were commanded by the white French chiefs," he said. "We were colonised by the French. We were forced to go to war. Forced to follow the orders that said, do this, do that, and we did. France has not been grateful. Not at all."